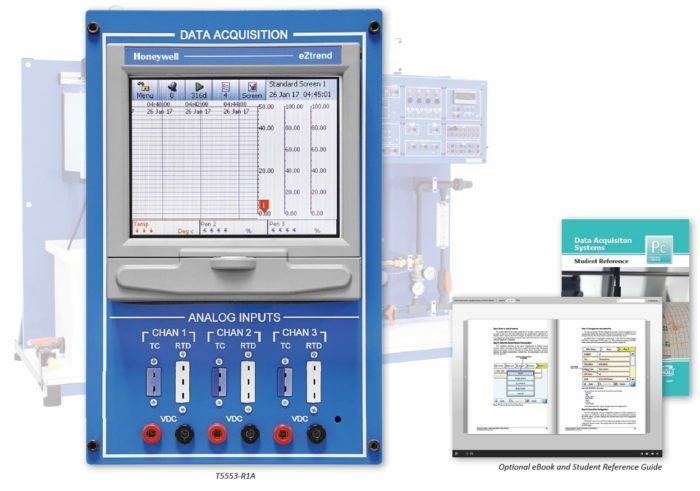 Amatrol’s Three-Channel Data Acquisition Learning System (T5553-R1A) adds to the Thermal Process Control Learning System (T5553) to teach the fundamentals of data acquisition. This system consists of equipment used to receive, record, and analyze process data. A chart recorder is one of the most commonly used pieces of data acquisition equipment. Chart recorders create a graphical representation of an electrical input signal received from an input device and provide an on-screen display of the process results. Chart recording is one of the most important skills a student can learn. The Three-Channel Data Acquisition training system identifies process variables, providing learners with the ability to accomplish work with navigation, digital chart recorder configuration, data transfer, and more, in a precise and effective manner. Amatrol uses components that learners will find on-the-job in order to give the best opportunity to build confidence and industrial competencies. The Three-Channel Data Acquisition uses real-world components to aid in teaching process variables such as temperature, flow, level and pH, as well as their changes over time. Learners will study how to use chart recorders to collect and display process data. The Data Acquisition training system includes a Honeywell eZtrend chart recorder, Honeywell Trend- Manager software, and a 10-Ohm precision resistor assembly. These technologies augment teaching of process instrumentation, enabling learners to observe what is happening inside the system and more clearly understand the effects of external disturbances and their own adjustments. This Data Acquisition training system also includes Amatrol’s world-class curriculum, which combines strong theoretical knowledge and concepts with hands-on skills for the best industrial competency-building on the market. Students will also learn how to use computer software to view and manipulate the data. This thorough, exceptionally detailed curriculum is built to begin with the basics and steadily advance to more complex concepts and skill. In addition to the included print curriculum, Amatrol offers this course in an online eBook format. Amatrol’s eBooks provide easy, quick navigation and searchable course content in an online computer-based format. A sample copy of the Three-Channel Data Acquisition Learning System Student Reference Guide is also included with the system for your evaluation. The Student Reference Guide takes the entire series’ technical content contained in the learning objectives and combines them into one perfectly-bound book. Student Reference Guides supplement this course by providing a condensed, inexpensive reference tool that learners will find invaluable once they finish their training making it the perfect course takeaway.